You are currently browsing the tag archive for the ‘Sedums’ tag. 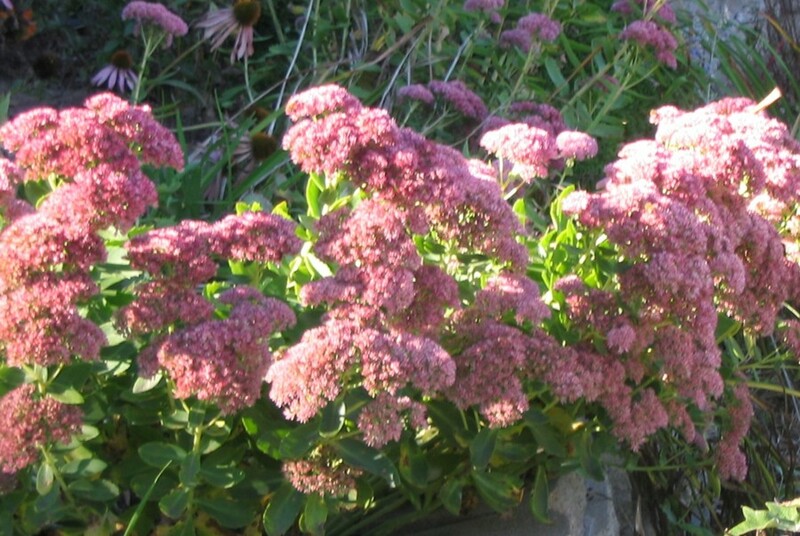 One of my favorite, and one of the easiest perennials to grow, is Sedum ‘Autumn Joy.” It is well worth growing for its late season color– soft pink umbels that deepen to a deep russet-rose standing twelve to twenty-four inches tall. The honey bees love them, too, which trait I’ve used to check our bee population. Autumn Joy is succulent hybrid of two sedum species created in 1955. The German nurserymen who hybridized this one must have been thrilled when this plant sprang up in their test fields since many of the sedums were low growing plants barely reaching six inches in height and the taller sedums were foliage plants without much to recommend as flowering plants. For me, Autumn Joy is the near perfect plant. It is extremely hardy and grows just about anywhere but excessively damp locations. With the added characteristics of interesting foliage, easy propagation, and beautiful, long-lasting, and colorful flowers at the end of the growing season, it finishes the fall garden in high style. All through August and sometimes even earlier in the summer the plant carries immature umbels containing hundreds of tiny green florets. The leaves are fleshy scalloped ovals that have a fresh light green color. The plant likes poor soil, doesn’t wilt in drought, and can be depended on season after season. Few pests or diseases bother Autumn Joy, and while it loves a sunny situation, it survives in shade. Grown in rich soil and a shaded locations, the flowers are often smaller and the stems long and floppy. If you must grow them in shade remember to cut them back in early June. The plants will put out more short stems that stay compact and sturdy. This makes them an interesting color and texture contrast to mix with almost any flowering plant. I find them particularly stunning among daylilies and yarrows where the cool green of their flower heads sets off the other plants’ hot colors. They also look great with coneflowers, grasses, mums, lady’s mantle, artemisia, asters, and zinnias. By the time their neighbors are finished flowering, Autumn Joy comes into its own vibrant coloring. Even if eaten by deer in early spring, they just grow more stems that will bear slightly smaller flower heads. If you want more plants, simply pluck a few stems from the mother plant in the spring and stick them in the soil. By the end of the season, you’ll have small new Autumn Joy plants. They keep their brown flower heads through the winter. This supposedly makes them interesting winter plants, but I never found them very attractive in this form, and I must admit it is a bit of a chore to cut old stems off in the spring. But that aside, what more can you ask from a garden plant?